Norwegian Polar Explorer Borge Ousland and French Adventurer Vincent Colliard are currently attempting the unsupported crossing of the St. Elias Ice Field. They started their expedition on the 21st of April and are currently on the ice for their third glacier crossing – after the successful Main Spitsbergen and Stikine Glacier crossings – of the Alpina & Ice Legacy Project, a long-term expedition project to become the first Men to cross the 20 largest glaciers on earth. The aim is to raise public awareness about the importance for mankind of preserving the ancestral ice, and to collect data for the scientific community. Both adventurers will wear the ALPINA HOROLOGICAL SMARTWATCH to measure their activity parameters and sleep during the crossing. Shared between Alaska and Canada, St Elias Wrangell Mountains Range Ice field is the largest non-polar ice field in the world with a total 31700 square kilometers and up to 1 kilometer thick. It nourishes many valley glaciers that drain down both sides of the range. St Elias Wrangell Mountains Range Ice Field is mostly in retreat. Plate tectonics are responsible for the uplift of the mountain ranges that cross the ice field. Its extreme high point is Mount St. Elias at 5,489 m, the second tallest mountain in both the United States and Canada. Also, the competing forces of volcanism and glaciation have shaped the ice field. Two main rivers border the ice field. The Copper River is a 290-mile (470 km) river in south-central Alaska known for its extensive delta ecosystem, as well as for its prolific runs of wild salmon. The river is the tenth largest in the United States. The Alsek river is a wilderness river flowing from Canada – Yukon into Northern British Columbia -and into Alaska. The ice field have advanced and retreated repeatedly, reaching the sea and filling the rivers of Copper and Alsek. St Elias Wrangell Mountains Range Ice Field has a wide variety of habitats. Much of the area is high mountain peaks covered with permanent ice. Rivers occupy broad, flat glacial valleys and have constantly-changing braided riverbeds. Apart from the relatively sterile glacial and riverbed areas, the environment can be divided into different categories such as: lowlands, wetlands, uplands, sub-alpine and alpine. Some of these environments are influenced and defined by the presence of permafrost, permanently frozen sub-soil. The animal life is quite rich in the area including black bears, wolves, brown bears, and caribou. Mountain goats and Dall sheep are found in mountainous areas. Many different species of fish and bird are also present in the region. The 2 explorers are planning to start their expedition around 20th of April. They will first embark on flying journey onboard a Cessna 185 with all their gear. The plan is to fly over the icecap all the way to the start point, Novatak area at approx. 59’ 24’’53N 138’ 22’’ 23W. From there, they will ski pulling their sleds for about 430 kilometers all the way to Miles area 60’40’’32N 144’ 36’’00W. Then Børge Ousland and Vincent Colliard hope to use their light rafts and paddle the Copper river for 30 to 40 kilometers before the pick up point. They will take food and fuel for approx. 40 days. Mid April 2016, Børge Ousland and Vincent Colliard will meet Dr. Jeffrey M. Welker – Professor of Biological Sciences – from the university of Anchorage in order to work together. The idea is about sampling snow for the spatial variation in “black carbon”, snow water isotopes, and using radar to examine glacier ice properties during the expedition. Consequently, the goal is to have the explorers bringing these samples and data back to professor Welker for future studies. It will be possible to follow the expedition daily through the website www.icelegacy.com directly on the home page. The website will be updated every day for whole length of the expedition. From the ice, the 2 explorers will transfer their position, some text describing the day on the field and also a photo in order to illustrate the text. The content will be then relayed on all IceLegacy and Alpina Watches social platforms. “Borge Ousland is undoubtedly the most experienced living polar explorer,” National Geographic Adventure. With more than 20 years of record-breaking Arctic and Antarctic expeditions, Norwegian Borge Ousland became the first explorer to complete a solo expedition to the North Pole without resupplying. As a Nansen and Amundsen heir, he was also the first to cross the Antarctic continent alone. Borge is also a renowned photographer and documentary filmmaker who has already received numerous international awards for his films and expeditions. Frenchman Vincent Colliard, 28 years old, is an experienced adventurer, having participated in expeditions across Norway, Patagonia, Alaska and the Himalayas. In 2010, he was a crewmember aboard “Northern Passage” with his mentor Borge Ousland during the historic first expedition/circumnavigation of the Arctic Ocean ever completed in a single season. Once again with his mentor, he completed the first crossing of Nordauslandet glacier in Spitsbergen in 2012. By supporting the IceLegacy project by Borge Ousland, the only man to have crossed the North and South poles alone, and Vincent Colliard, young adventurer and Borge Ousland’s partner, Alpina Watches wants to promote the protection of the glaciers, an environmental and climate issue that is dire yet little known, yet of enormous importance for the future of our planet. The project combines athletic prowess, human adventure and the sharing of knowledge about the polar environment with as many people as possible, so that future generations may enjoy the fascinating and priceless legacy of glaciers and icecaps: believe, preserve, transmit. Borge and Vincent will measure their effort with the Alpina Horological Smartwatch. 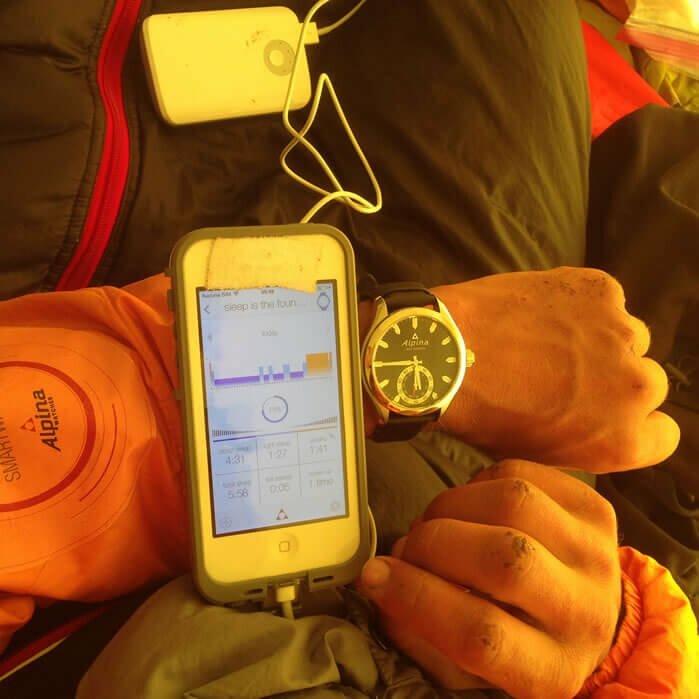 The watch will measure the distance covered, their steps, calories burned and sleep profile during the entire crossing. The watch will also wake them up when their body is most ready for their effort. The Alpina Horological Smartwatch is the synthesis of high-tech innovation and traditional Swiss watch craftsmanship. There is no digital screen on the Alpina Horological Smartwatch. Instead, the beautiful laser cut hands on the watch dial display information in analog form. The Alpina Horological Smartwatches retain their natural classic beauty and can deliver the benefits of the quantified self, all without ever having to recharge a battery. The MotionX patented sensor-fusion engine tracks activity and sleep patterns with high accuracy. Activity and sleep information is presented in real-time using beautiful traditional analog dials. The watch synchronizes automatically with applications on Apple and Android smartphones. On the iOS and Android apps, simple and easy-to-understand graphics highlight how much one has moved and slept during the day, week, or month. This data will assist users to better understanding themselves, and along with appropriate goal setting and intelligent coaching, will improve their well-being. Better sleep and a more active lifestyle are widely recognized as simple, but effective, positive behavioral changes. A true pioneer of the Swiss watchmaking industry, Alpina has been the source of numerous patents and innovative calibers. Alpina invented the concept of the Swiss sport watch, as we know it today, with the birth of its legendary Alpina 4 in 1938. Today, Alpina is one of the very few independent Swiss watch companies, which develops, produces and assembles its movements entirely in-house. Alpina proposes five in-house calibers: the AL-980 Tourbillon; the AL-718 World Timer; the AL-950 Automatic Regulator; the AL-710 Automatic Small Date, and, most recently, the AL-760 Flyback Chronograph, featuring the new and patented “Direct Flyback” technology. 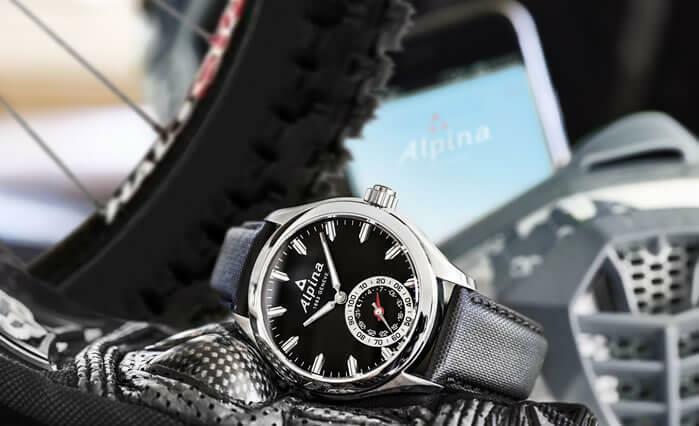 Faithful to its long tradition of innovation, in 2015 Alpina introduced the first connected Swiss Made Horological Smartwatch, thereby creating an entirely new watch category in the Swiss watch industry. Previous articleAre children really dictating their own style choices including jewelry?